This simple structure would be easily adaptable for a wide range of ages and purposes. Students could write about a favorite place or a researched region, for starters. I also appreciate that the author chose to include the full text of the poem one a single page at the back of the book (in both English and Spanish). 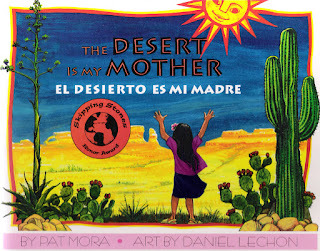 Do you have favorite mentor texts for teaching poetry? Margaret has this week's Poetry Friday roundup at Reflections on the Teche. Wow, this is lovely, Katie. I will note it & try to find it. I have so many poetry books that I love and have used. The older one I still give as a gift sometimes is Knock At A Star, with help before the wonderful poems shared, by XJ Kennedy. Have a wonderful weekend. Thanks for this mentor text. I love introducing structures to my students that allow for personal expression. Agreed. Especially with elementary students I have found that they often end being "more" creative when given the bones of a structure to start from!